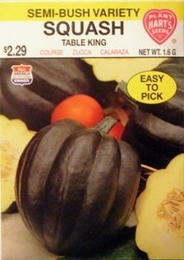 This outstanding winter squash is one of the earliest acorns. Vigorous, wilt tolerant, semi-bush vines produce handsome dark green fruits. High quality, fibreless orange flesh is thick and flavorful. Fruits are 5 inches, just the right size for two servings. Delicious in pies or cut into pieces and baked, steamed, or boiled. Cut squash from vines with pruning shears.